The Istanbul Prosecutor’s Office announced on Saturday that investigations are under way in nine provinces including Istanbul into 1,004 judges and prosecutors and 68 governors and district governors over links to the Gülen movement, which is accused by the Turkish government of masterminding a failed coup attempt on July 15, DHA reported. According to the statement, court cases have been launched for 162 of 1,004 judges and prosecutors, while investigations into the governors and district governors are continuing. A total of 448 of the 1,004 judges and prosecutors are in jail, while 400 have been released on judicial probation. Fifty-seven judges and prosecutors are at large, and 99 were allowed to return to their job. Justice Minister Bekir Bozdağ on Friday said more than 4,000 judges and prosecutors have been dismissed over links to the Gülen movement and that none of the remaining judges and prosecutors have been left uninvestigated. 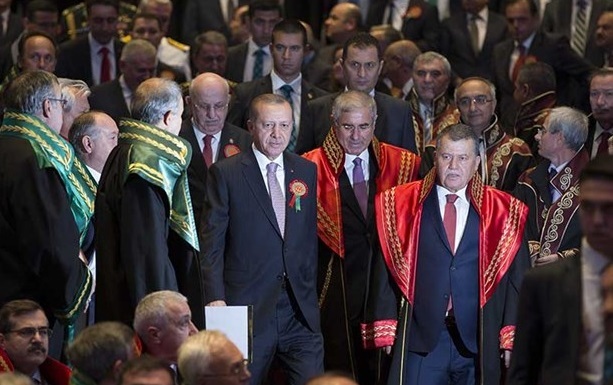 The government has been criticized for using the coup attempt as an excuse to purge judges and prosecutors and replace them with names close to the ruling Justice and Development Party (AKP) and President Recep Tayyip Erdoğan. Main opposition Republican People’s Party (CHP) İstanbul deputy Barış Yarkadaş recently said the AKP government had recruited for the position of judge 800 lawyers who had ties to the party. Justice Minister Bozdağ on Aug. 17 announced a government plan to name 8,000 new judges and prosecutors by the end of 2016. On Dec 8, 2016, the European Networks of Councils for the Judiciary (ENCJ) suspended the observer status of Turkey’s Supreme Board of Judges and Prosecutors (HSYK) and excluded it from participation in ENCJ activities for the mass suspension and dismissal of judges and prosecutors and the failure to comply with the European Standards for Councils for the Judiciary. Immediately after the failed coup attempt on July 15, the AKP government along with President Erdoğan pinned the blame on the Gülen group.